Mesa Verde National Park. View looking down a V-shaped erosional canyon between mesa. Sandstone forms the canyon rim and the cap rock of the mesa. Credit: USGS. 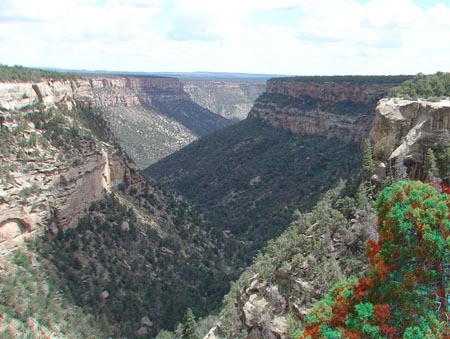 A mesa is a flat-topped, steep-sided, table-like mountain (mesa is Spanish for "table") capped with a formation or stratum, which is relatively horizontal and resistant to erosion. When such a topographic feature is less than one square mile (2.6 square kilometers) in area it is usually called a butte.